Every year, I am energized by the month of September. There’s something about Childhood Cancer Awareness Month that brings me back to the Friday evenings that I’ve spent with pediatric oncology patients and their families over the years. I am reminded of the time I devoted to getting to know these children and teens through my research; I have been so moved by these children, teens, and families. This month reawakens in me my desire to raise awareness of childhood cancer, namely by helping to spread the word about the Chronicling Childhood Cancer book. It takes an incredible amount of courage and strength to do what these young authors, these children and teens, have done– to share their personal experiences with cancer. That’s why I want these stories to be heard by as many people as will listen. I believe that the Chronicling Childhood Cancer book really is unique and compelling, that anyone and everyone can learn something from it. I guess that’s why I’m so motivated to share these stories and shamelessly promote the book. Chronicling Childhood Cancer: A Collection of Personal Stories by Children and Teens with Cancer is a book that was created from a project that I started with C.S. Mott Children’s Hospital patients for my Honors thesis in English. All of the proceeds of this book are donated to Mott: 50% to the Block Out Cancer campaign for pediatric cancer research at the University of Michigan and 50% to the Child and Family Life Program at Mott. This month, I’ll be sharing daily excerpts from the book via Twitter to raise awareness about childhood cancer. It feels strange to be taking these quotes out of context and into the 135-character tweets, but my hope is that this is a way for me to make them more accessible to a larger audience. To offer a sneak preview of sorts, into the Chronicling Childhood Cancer book as well as into the personal lives of these young children and teens with cancer. While September gives me momentum, I know that this one month is not enough for this important cause. So much has to happen, and to pretend as though one month were enough time to raise ‘enough’ awareness (if there even were such a thing) is absurd. So stay tuned for more about what I have planned for this year! Kicking Off Childhood Cancer Awareness Month by Answering the Question: Why? The long-anticipated month of September has finally arrived: it’s National Childhood Cancer Awareness Month. As I have become more involved in the cause of childhood cancer, people have asked me why. And I think it’s important for me to be upfront about my background. No, I am not a childhood cancer survivor, nor do I have any close friends or family that have gone through the experience. But I believe that you don’t have to be personally touched by childhood cancer to care. Volunteering with pediatric oncology patients at C.S. Mott Children’s Hospital was all it took to expose me to this different world. For me, getting to know these children and their families and witnessing how cancer permeated their lives made me determined to do something. While I currently aspire to be a pediatric oncologist and to dedicate my career to these children, I also realize that a lot can change throughout the course of my medical education. Nevertheless, I know that childhood cancer will always be a cause that I hold dear to my heart– I know that I will continue to support these children and their families in whatever capacity that I can. In addition to sharing her story through the book Grace, Melinda Marchiano gave voice to her experiences through a language of her own: dance. Through the Fire embodies her illness experience with childhood cancer. My name is Trisha, and I help children tell their stories to Block Out Cancer. Melinda Marchiano and I share a number of similarities. We are writers who come to understand the world and our own experiences through language. We are dancers who have unearthed a passion that we will pursue for the rest of our lives. We are aspiring pediatric oncologists, eager and excited to pursue medical careers. But unlike Melinda, I’ve only encountered cancer from “the outside of the needles and sickness” (Greer 52). 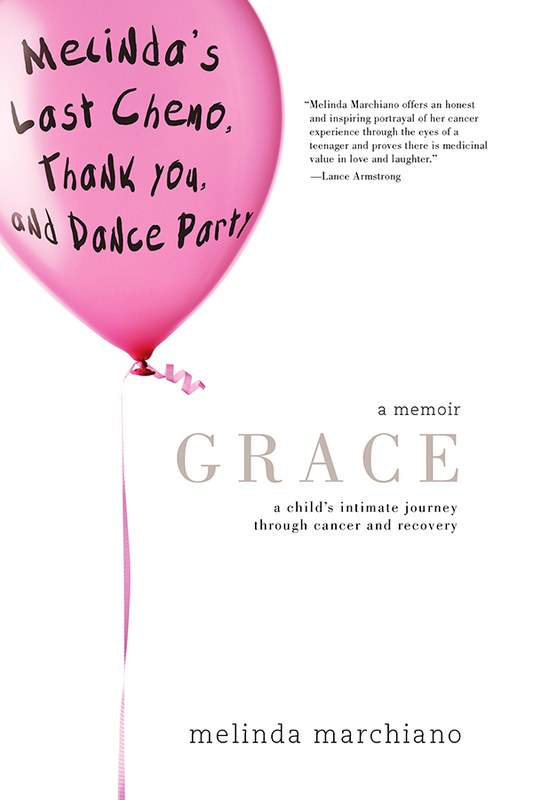 I met Marchiano by reading her memoir, Grace: A Child’s Intimate Journey through Cancer and Recovery. Marchiano writes her story in journal entries of sorts with interspersed snapshots of milestone memories and powerful quotes. She reflects deeply on her cancer experiences, sharing her thoughts on the diagnostic label of cancer, the paradoxical effects of chemotherapy, and the tensions of mind and body through illness. Her conversational and confessional writing reveals her sense of humor and personality. “[Chemotherapy’s] a sort of ‘chemical feeling,’ like battery acid that races through your veins. I felt terrible, and as I write this now, recalling how sick I was, nausea and dizziness have returned to me. I only now noticed that, feeling so passionate about my writing, I am virtually reexperiencing it. Chemo may eventually leave your body, but it always stays with you” (50). “I longed for the feeling of dancing, the feeling of freedom, the feeling of the studio air filling my lungs, and the feeling of my heart beating as one with the music. I decided I would work hard. I would do it…I would dance again. The fear of hard work did not exist within me. Becoming accustomed to pain, I now didn’t care one bit how badly anything hurt” (119). “I noticed that, hey, maybe I did have a story. But if, indeed, I did, I didn’t really think that anyone would want to hear it” (140). “When I wrote my speech, I questioned how much I should share. Pondering it for quite some time, I decided to lay it all on the line, to give it to them straight. Cancer does exist. My suffering was real, and I needed to acknowledge that” (224). “Cancer kids need just as much help after treatment as during. We’re like giant walking wounds, with each touch stinging and painful. Only time can make the wound scab over and begin to heal. But during that vulnerable time, we need a Band-aid” (272). Marchiano now advocates strongly for childhood cancer research. In sharing her story, she has found that “my cancer had a meaning– a purpose. It was doing what I thought it was not capable of doing — giving” (196). Jason Greer’s memoir Very Much Better holds within it a piece of his cancer. Diagnosed with Ewing’s sarcoma on the brink of adolescence, Greer leaves behind his hometown in Montana for the Children’s Hospital in Seattle, Washington. But he finds strength in support from his loved ones, family and friends . For Greer, “faith…is the crying from inside the soul to plunge into living”; his beliefs energize him throughout his journey (117). Greer smoothly melds his retroactive retelling of the past with “a look back” from his present point of view. 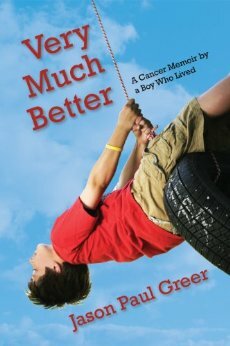 We become familiar with Greer as an 11-year old boy and as a grown-up adult, the during and the after of cancer, and we witness how the disease matures him hastily. He intersperses medical terms such as “pre-op” or “outpatient,” denoting their foreign nature by quotation marks (10;14). With witty chapter titles like “The Art of Throwing Up” and “The Cancer Patient’s Guide to Duct Tape,” personality and a sense of humor shine through each adventure (xi). What struck me most about Greer’s memoir was his powerful grasp of his experiences. Particularly eloquent was his ability to capture one of the most emotional aspects of coping with childhood cancer: losing others to the disease. The deaths of Erik, Chad, and Jesse are each heart-wrenching in their own right, and Greer illuminates their important place within his own cancer experiences. “Cancer threatened each of us, for a time was inescapable, and seemed to be everywhere. But as we sat in the company of each other’s encouragement, we surrounded the disease — and we defied it, every part of it” (83). “She is simple. She is our Elena” (x). A grown-up, 5-year-old girl who loved hearts, dresses, and the color pink. Her life was colored by her experiences with DIPG, a rare form of brain cancer. 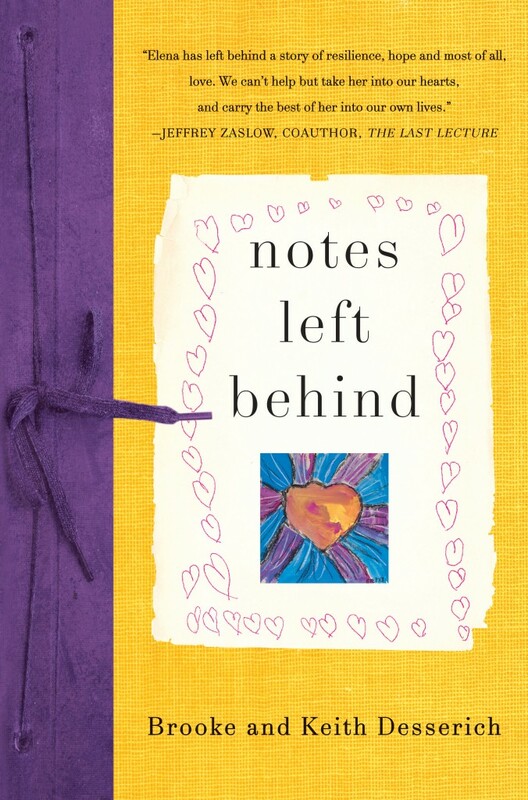 Notes Left Behind is a collection of journal entries written by Elena’s parents, Brooke and Keith Desserich. What began as a preservation of memories to share with Elena’s sister Gracie quickly became more meaningful to both the Desseriches and all those who cared about Elena. The Desseriches chronicle their letters by the date and the number of days since diagnosis, the day Elena was given an estimate of 135 days to live. Brooke and Keith take turns writing entries that coalesce to provide a more holistic, parental view of caring for a child with cancer and her sibling. While Elena wrote many notes to her loved ones, “this book too is a note from Elena, messages from a little girl who taught our family so much about life” (xiv). Elena’s sweet, sincere personality shines through the eyes of her parents, who share with us her experiences in losing her voice, gaining weight from steroids, and wanting nothing more than to be normal once more. In the face of cancer, questions emerge about the daunting uncertainties and the forgotten nuances. Keith grapples with these question marks and calls out our band-aids, noting that “cures don’t come on toy shelves and they don’t have tags” (64). He reminds us that these material objects are powerful yet insufficient when lives are still at stake. It’s refreshing to remember that at the root of each childhood cancer is a need for a cure. Inspired by their personal experiences with the incurable, the Desseriches started the organization The Cure Starts Now. With an emphasis on finding a cure for brain cancer, this organization believes that a cure for all cancers can be found in this elusive disease. Elena has touched the lives of those around her and more. She has left behind more than notes.